Earl bought an Army truck when he got out of the service. He used it to pull vehicles out of the sand and help in fishing. The dirt road goes down to the Rocks. 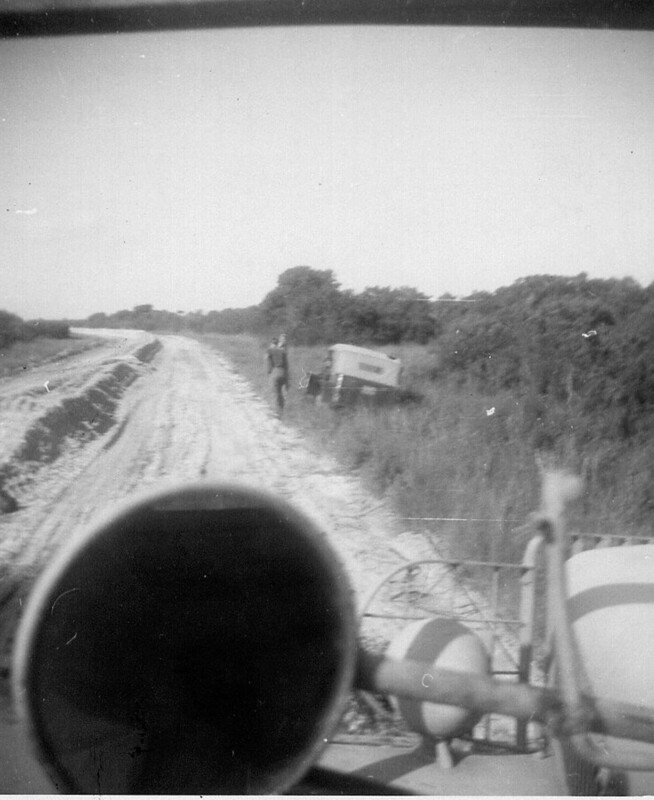 The picture shows just two ruts in the dirt road. The highway ended this side of the Museum. Then it became a cow path. Earl was on his way to help a guy raise a sail boat. He had to get there across a ditch. He pulled lots of vehicles out of the sand. They’d get stuck at the beach. It looked like a car was sitting right in the water. Earl’s truck had front wheel drive. 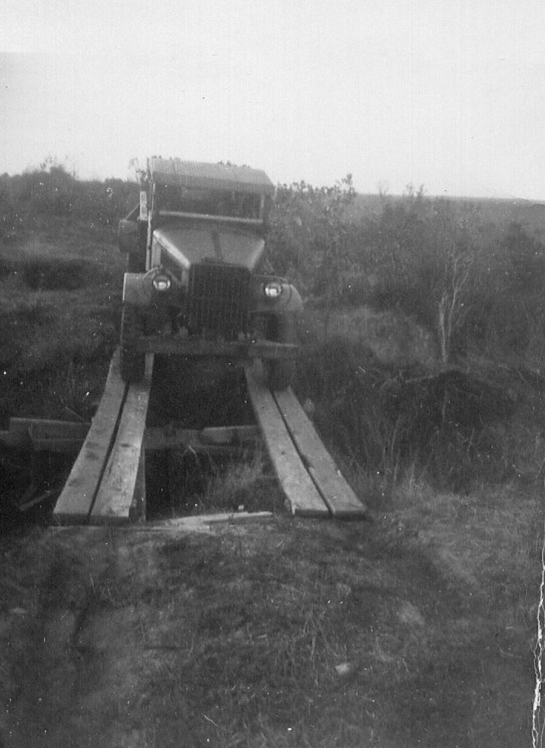 No one had 4- wheel drive back then. There were only two 4-wheel drive vehicles on this beach – Earl’s and a garage at Carolina Beach. Earl drove in water going out in the Bay to get a jeep. A guy walked in front looking for holes. He pulled a taxi cab out of the ocean. He took pictures and it’s a good thing because the insurance company didn’t believe it. Earl pulled a tank out of the ocean. A ship barge lost it. When Earl contacted the owners, they said we could keep it because it would cost more for them to come get it. Three men rowed out in the ocean in a row boat and brought the tank in close enough that Earl could get a wench on it. 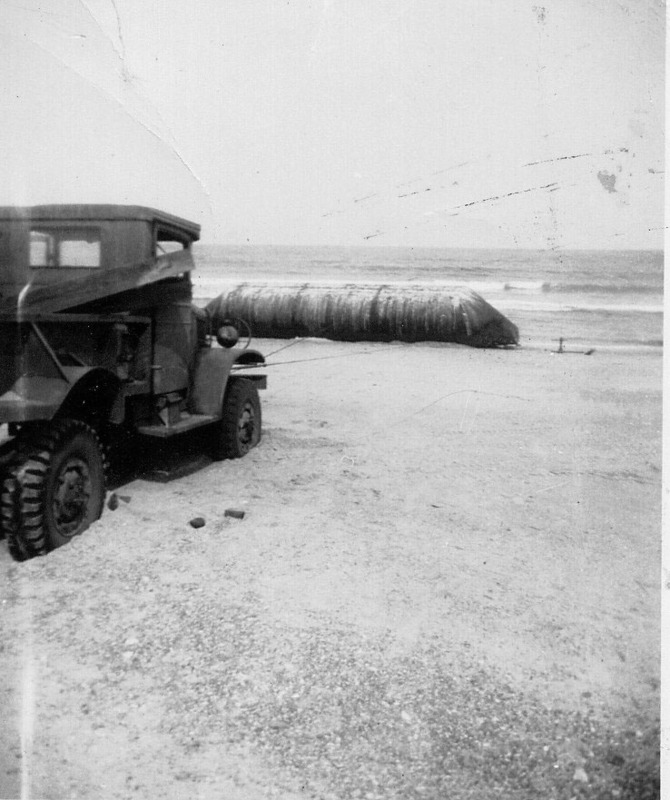 Many had to have vehicles pulled off the beach because they didn’t know how to drive on the beach. It was like Daytona Beach at low tide – someone went down to Corncake Inlet driving on the beach. To turn around, he drove down toward the ocean and then tried to back up in the soft sand; the wheels sunk and the tide came in. Thank goodness for that Army truck. The beach was very wide. If you stand with your back to the Fort Fisher monument, look out into the ocean, and hold your hand at a 10 o’clock angle you can see how wide the beach was. But right there, at 60 degrees, it’s nothing but rocks. It looked like Coney Island. It was beautiful. But you couldn’t park and you had cliffs. You couldn’t get down right there unless you had an Army truck. From the President – November, 2012 Epidemic! Quarantine!